Nonfarm payroll employment edged down (-95,000) in September, and the unemployment rate was unchanged at 9.6 percent, the U.S. Bureau of Labor Statistics reported today. Government employment declined (-159,000), reflecting both a drop in the number of temporary jobs for Census 2010 and job losses in local government. Private-sector payroll employment continued to trend up modestly (+64,000). Census 2010 hiring decreased 77,000 in September. Non-farm payroll employment decreased 18,000 in September ex-Census. Both July and August payroll employment were revised down. The change in total nonfarm payroll employment for July was revised from -54,000 to -66,000, and the change for August was revised from -54,000 to -57,000…. Nonfarm payrolls decreased by 95 thousand in August. The economy has gained 334 thousand jobs over the last year, and lost 7.75 million jobs since the recession started in December 2007. The dotted line is ex-Census hiring. The two lines have joined since the decennial Census is almost over. 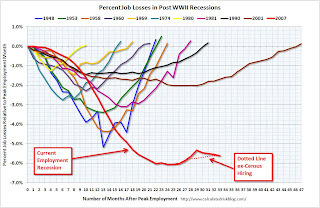 For the current employment recession, employment peaked in December 2007, and this recession is by far the worst recession since WWII in percentage terms, and 2nd worst in terms of the unemployment rate (only early ’80s recession with a peak of 10.8 percent was worse). This is not very good news at all. The “recovery” has been very slow and now it continues to slowdown, not accelerate as we need. At present, we are in danger of “double-dipping” into recession again, largely because the federal stimulus is being withdrawn, private investment spending is nearly non-existent, and monetary policy has reached very severe limits at zero interest rates. Even if the GDP growth did not slow down in 3rd quarter (I think it did) and continued to grow at the 1.6-1.7% annual real growth rate of the 2nd quarter, we won’t get back to full employment until nearly 2020, if at all. Ok, continuing the series on the mortgage foreclosure crisis here. For background on the legal side of the problem see Part 1 and for a humorous look by Jon Stewart at the crisis see Part 2. The industry has argued in response that problems should be addressed without halting all foreclosures, because a moratorium would damage the economy. “It must be recognized that the mortgage market, investors and the health of the economy are all interrelated,” Tim Ryan, president of the Securities Industry and Financial Markets Association, said Monday. The White House shares those concerns, and it has tried to defuse the issue by arguing that problems can be addressed without imposing a moratorium. “There are, in fact, valid foreclosures that probably should go forward,” David Axelrod, a senior White House adviser, said Sunday on CBS. Administration officials argue in part that the problems that have emerged in recent weeks do not change the fact that lenders are seeking to foreclose on people who borrowed and then failed to repay. Most of the identified problems are best described as technicalities, not miscarriages of justice. Advocates for homeowners, however, say that the pattern of sloppiness allows and encourages more serious abuses. They point to a growing number of documented cases in which lenders mistakenly seized homes. Bank of America apologized last month for foreclosing on a home in Fort Lauderdale, Fla. The homeowner didn’t even have a mortgage. The bank had failed to notice that the previous owner had repaid the mortgage loan. Last year the company’s contractors entered the home of a Pittsburgh woman, changed the locks, cut off the utilities and seized her pet parrot. The bank later acknowledged that the woman had not missed any mortgage payments. Other companies including Citigroup and JPMorgan Chase also have apologized for mistaken attempts to seize homes they didn’t own. Dozens of people have sued lenders charging that their homes were foreclosed even after the lender agreed to a loan modification or repayment plan. I just don’t accept that foreclosing and seizing (really stealing) a house that DID NOT HAVE A MORTGAGE is more than a “paperwork glitch”. There’s much more to this crisis.